I’m referring to yesterday’s great sour cabbage experiment. Did I mention we were out of paprika? I will say this, the eight dollar pickled cabbage head was a joy to work with. Not too salty nor too sour, just the right size, and the leaves were nice and loose, easy to fold and tuck. Unfortunatley it wasn’t until I’d made about half a dozen that I remembered they’re called cabbage rolls for a reason. Mine looked like cabbage hambugers. Peter said not to worry, they were fine, he preferred a meatier version anyway; we’d simply rename them, he said. We’d call them cabbage packages. I was just thankful we’d already given up on the Moroccan element. I rolled the last few into a slightly more recognizable shape, bunged them into a pot—or no, sorry, I carefully layered them between more of my sour cabbage leaves, then slopped on the wretched tomato sauce (I firmly believe it’s all about the sauce; that’s what flavours the meat and the rice, no? And if you’re using a can—a can for pity’s sake—well how on earth can anything good come of it?? But we were in a pinch so I’ll shut up about it…), then Peter poured us each a glass of wine while they cooked and by some miracle my mood improved and the package/rolls actually turned out tasting much better than they looked. Okay, that’s probably long enough. I think they look great! Any attempts by me to make pretty ovals of cabbage rolls comes off all wrong. 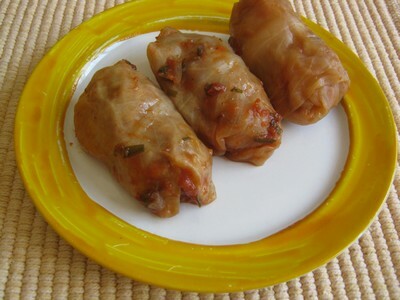 My elderly Polish acquaintance makes the most perfect dainty cabbage rolls with tomato sauce – and they don’t fall apart, or burst open. I figure I need to be elderly and Polish to have the knack (and 65 years of practice). But I loved how you and Peter arrived at your recipe. I’m still not sure I’d be lining up to buy the pickled cabbage at Metro. Your photo needs only a little more sauce drizzled on it to make the photo perfect. I think these look pretty good and quite appetizing. Cabbage rolls are hearty fare and not supposed to be dainty. Well done! Peter would agree with you on the hearty fare side of things. Me, I’d rather them a titch more petite! Next time I make them I’ll offer S, M, L, and XL sizes.